AVR910 compatible programmers are connected via an asyncronous RS-232 port. The programming hardware can be serial or parallel, the hardware that is described in the application note is a simple low-voltage serial programmer controlled by an AT90S1200. Most ISP functions are controlled by the firmware. But there are some things that must be initiated by the driver (like writing pages to the Flash-EPROM). Therefore the driver also needs knowledge about the device to program - in other words: must support this device. The device support therefore depends on both the driver and the firmware version. The system load created by the driver for this programmer is low. Therefore very old machines are sufficient to use it - even if they do not have a fixed disk (Verified using a 286-10 machine with a 16550A UART running DOS). The application note AVR910 can be downloaded from Atmel: Application note AVR910. It is controlled by an AT90S2313. 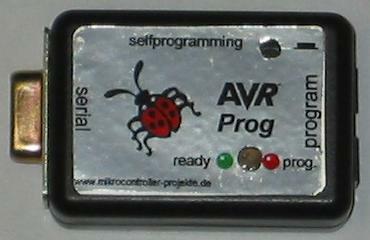 More information: AVR910 compatible programmer from Klaus Leidinger. For the original Atmel hardware use Atmels firmware V2.x (V2.2 or newer is recommended). Current Atmel version: Firmware V2.3. For Klaus Leidingers hardware use his matching extended firmware: Firmware V3.x from Klaus Leidinger.